What Lon Chaney, master of makeup, was to faces, Mel Blanc was to voices. That is, Blanc was the man of a thousand voices. Voices every child knows instantly—the wisecracking Bugs Bunny chewing on the end of a carrot with his famous question, “What’s up Doc?” Or the voice of the frenetic Daffy Duck, or the hoarse and rowdy Yosemite Sam. These voices filled the Saturday morning cartoon lineup for decades and his voice still rings in children’s ears through re-runs. 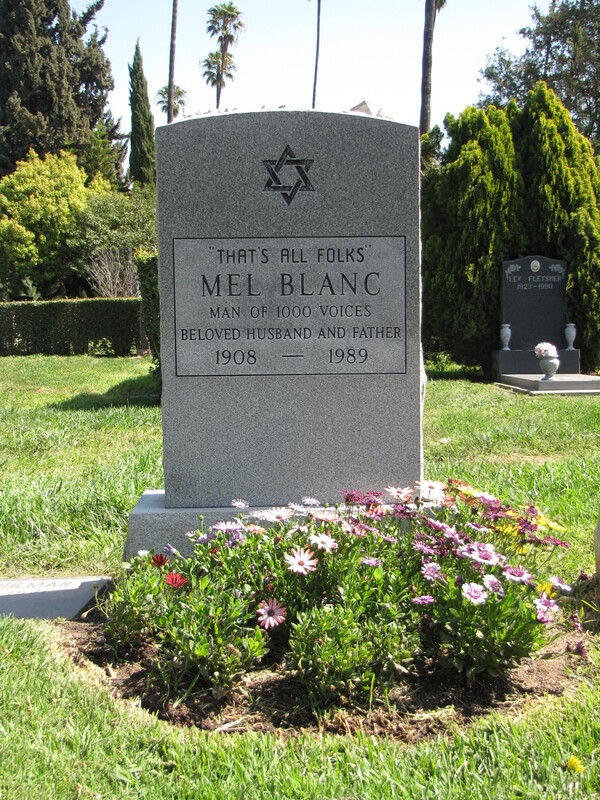 Mel Blanc was born on May 30, 1908, Melvin Jerome “Mel” Blank at San Francisco, California. Blanc claimed that he changed the spelling of his name because of a chance remark a teacher made, who said to him, with that last name he would amount to nothing. He dropped the “k” and added the “c” and changed the spelling of his name. 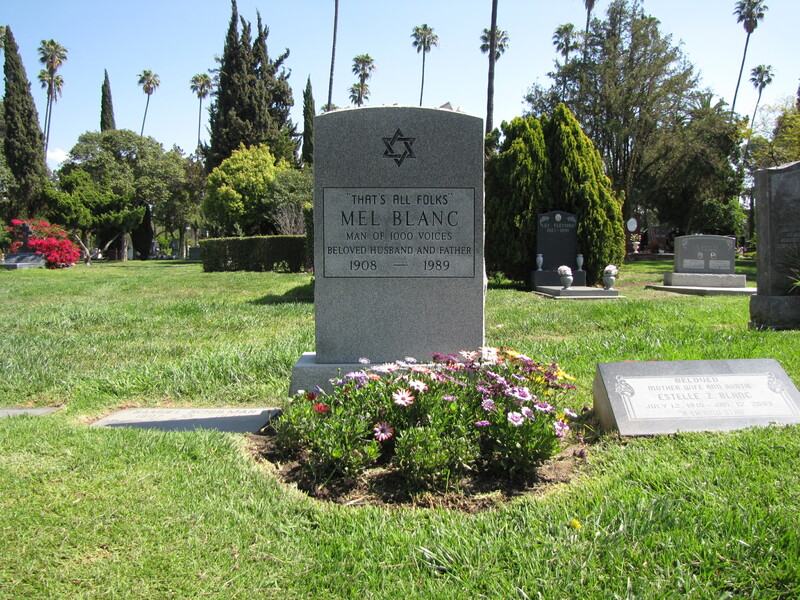 That one letter change evidently was providential enough to make a difference, because Mel Blanc will be remembered and the name of the teacher who made the remark has been long forgotten. In 1927, Blanc began his career as a voice actor on a radio program, The Hoot Owls, on KGW where he did several different voices. For the next 62 years, Blanc performed as some of the most beloved Warner Brothers characters ever animated for the movies and television—including the Foghorn Leghorn, Sylvester the Cat, Speedy Gonzales, Wile E. Coyote, and the Tasmanian Devil. Blanc was also the voice for notable Hanna-Barbera characters, too, such as Barney Rubble in The Flintstones and Mr. Spacely in The Jetsons. As if the list wasn’t long enough, Blanc was also the original Woody the Woodpecker, a smash-hit cartoon for Universal. But, the most famous voice was probably that of Porky Pig, the hapless and chubby pig who never bagged the “silly rabbit”. His was also the last voice you’d hear in a Warner Brothers Cartoon at the close of the cartoon a circle would draw around Porky and he would stutter and stammer, “That’s All Folks”. The trademark phrase, “That’s All Folks”, at the direction of Blanc’s will was carved into his gravestone. We’ll never know if that was just a nod to his famous cartoon character’s sign off or if it was a deeper sentiment about life itself.